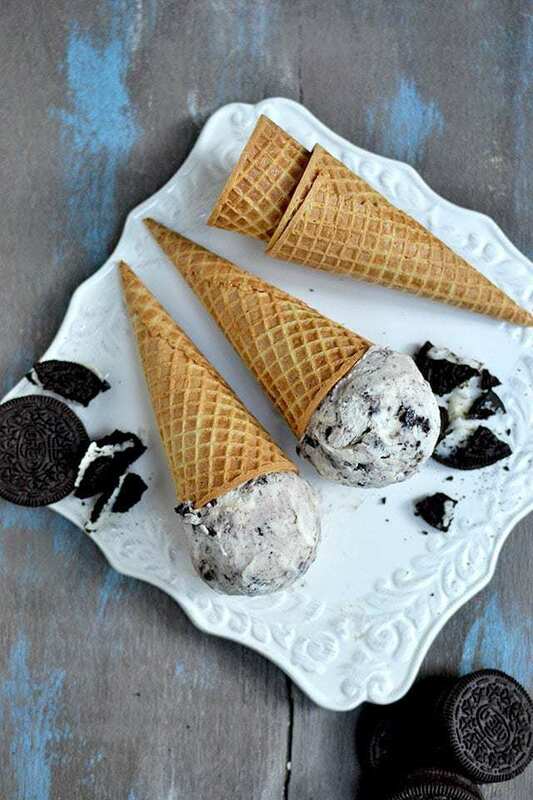 Recipe to make once of the most popular ice cream flavor -- Cookies & Cream Ice Cream. It is nothing but vanilla ice cream base swirled with crushed chocolate wafer cookies (like oreos). In a small bowl, whisk corn starch with 3tbsp milk and set aside. Combine milk, heavy cream, sugar and light corn syrup in a large sauce pan. Bring the mixture to a boil and let it simmer for 4 minutes or until the sugar is completely dissolved. Turn off the heat. Gradually add the corn starch mixture. Return to boil and cook on moderately high heat, whisking continuously, until the mixture thickens and coats the back of the spoon, about 3~4 minutes. Remove from heat and stir in the cream cheese and vanilla extract. Let the mixture cool completely. Chill for at least 4 hours or overnight. Once thoroughly chilled, follow your ice cream machine instructions to make the ice cream. Stir in the crushed oreos into the ice cream and enjoy right away or freeze for later.